We stayed very much on the gringo trail here heading to Antigua, a lovely colonial town with plenty of people watching opportunities. Everybody goes to Panajachel from here which is an old hippy town on the shores of Lake Atitlan and the launch point for trips to the Sunday market at Chichicastenango, a tourist's delight with hundreds of buying opportunities. We booked a flight to Flores in the north and ended up in a real 'Biggles' of an aeroplane which we boarded in the outer reaches of the airport rather than the main terminal, but it got us there in one piece. 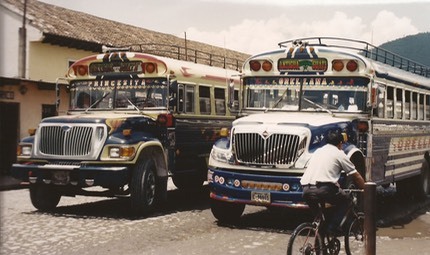 A couple of fine examples of chicken buses, so called as that is probably what will be sitting next to you. 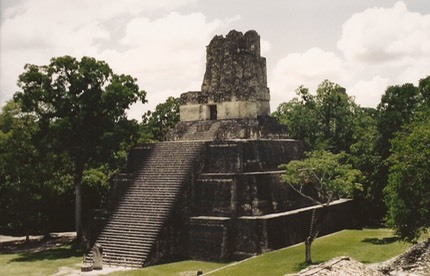 Tikal is another fantastic Mayan site in deep jungle featuring 5 huge pyramids and a host of smaller buildings and temples. There is also great bird watching as well. We hired a local guide here and got a fat sweating Guatemalan who huffed and puffed the whole way round for 4 hours. The following day we came back by ourselves for photo opportunities before moving onto Mexico. We had a lovely hotel here with a swimming pool so also relaxed a half day doing nothing. 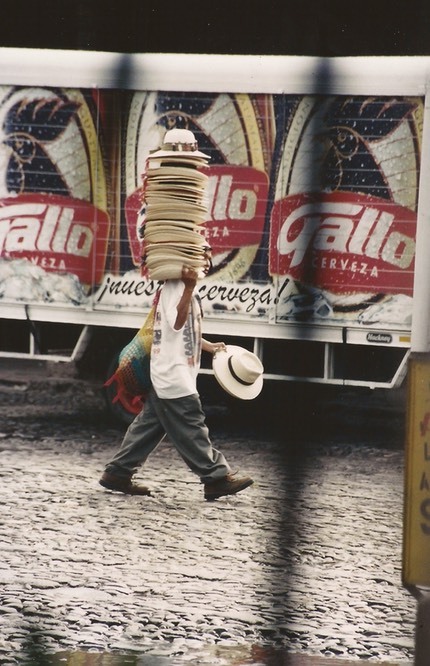 I took this picture in Antigua, as it amused me. He certainly has a head for hats. Gallo (Chicken) is the tasty local beer.